Anyone who has been to Brazil knows that it is one of the most stunningly beautiful places on earth. It has lush, tropical jungles, rolling mountains, and serenely inviting beaches. Perhaps, we have found an incentive for you to move to this nation of paradise permanently? Brazilian architecture firm Jacobsen Arquitetura has just recently completed a project that has been under construction since 2005, and the results were well worth the wait. Called simply ‘Casa Trancosco,” it is a dream home to end all homes. 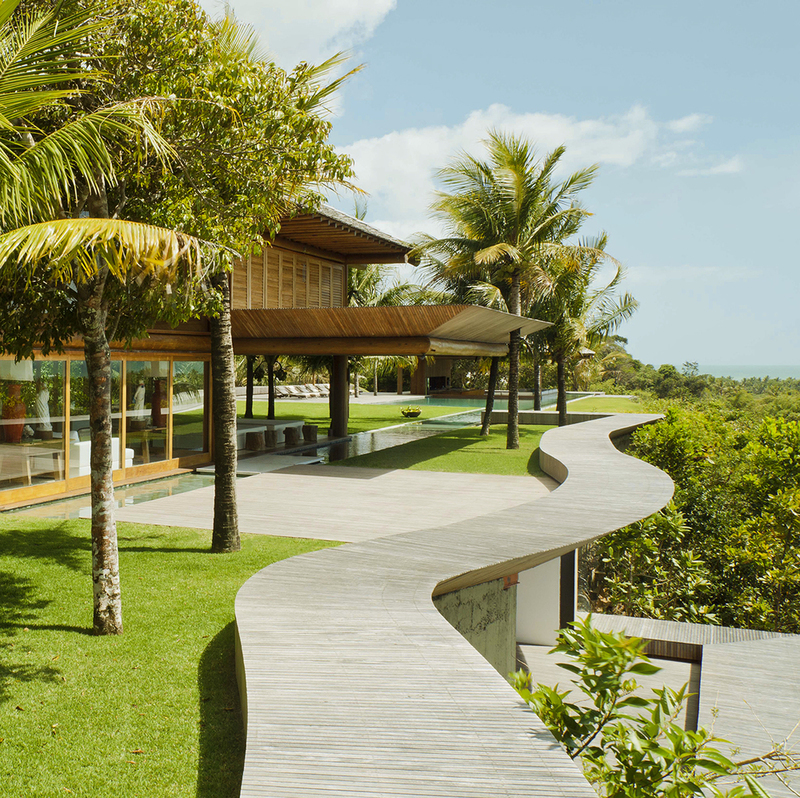 The house is located in the Bahia region of Brazil, close to the sprawling metropolis of Salvador, but also relatively equidistant to Rio de Janeiro and the nation’s capital, Brasilia. There are many other structures designed by Jacobsen in these cities, but this one ultimately stands out as one of their most unique pieces to date. First and foremost, water is an essential part of the Casa Trancosco experience. Located atop a mountain, there are 180-degree views of the intoxicatingly gorgeous beachfront that are visible from most anywhere in the house. The views alone would seem enough, however the house is divided into three sections, or blocks, that are connected with a series of swimming pools and something that Jacobsen refers to as ‘water mirrors,’ physically connecting the portions of the house and aesthetically connecting the aquatic expanse around you. Aesthetic connections abound even in the construction materials of the house. Using structures primarily made from logs and something called ‘taubhila’ coverage in order to make a seamless transition from the house into the surrounding environmental landscape. The overall appearance therefore resembles something like a 1960’s mod themed version of a Robinson Crusoe bungalow. Casa Trancosco seems like it is a literal heaven on earth, but unfortunately its purpose is to be a private residence. We can only hope that Jacobsen will next consider designing a hotel in the area so everybody can get a taste of his wonderfully paradisiacal visions.